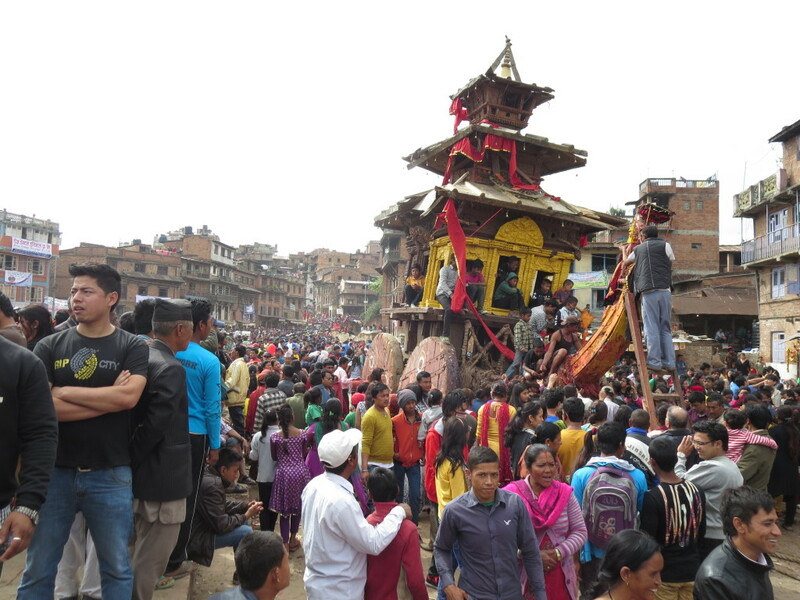 The town of Bhaktapur is known throughout Nepal for its New Year’s merrymaking and, judging by your lunar calendar, you’ve arrived just in time. It is the afternoon of New Year’s Eve when you step through the gates marking the entrance to the medieval city, and the narrow streets are awash in local color. Bright flags weave together with electrical wires and clotheslines overhead to form a festive canopy. Wrinkled women in sarongs and knit sweaters grin from behind fruit carts piled high with green grapes, sweet bananas and juicing oranges. Opportunistic entrepreneurs bait children with balloons and wooden whistles, trading trinkets for rupees with obliging parents on street corners. 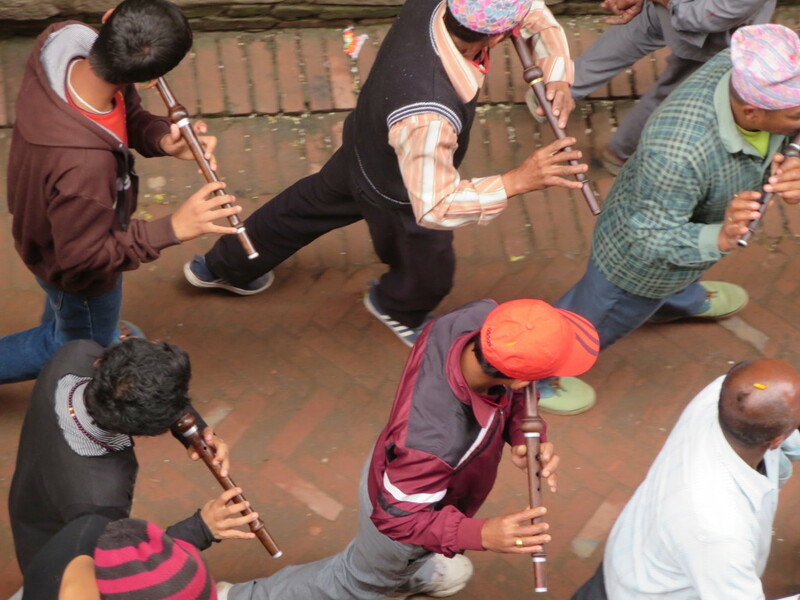 Bands of roving musicians sound drums and flutes as they process through gathering crowds. 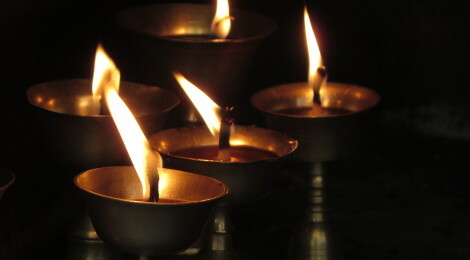 The religious and superstitious light butter candles around sacred temples. The New Year’s Eve crowd in Bhaktapur, Nepal begins to grow. 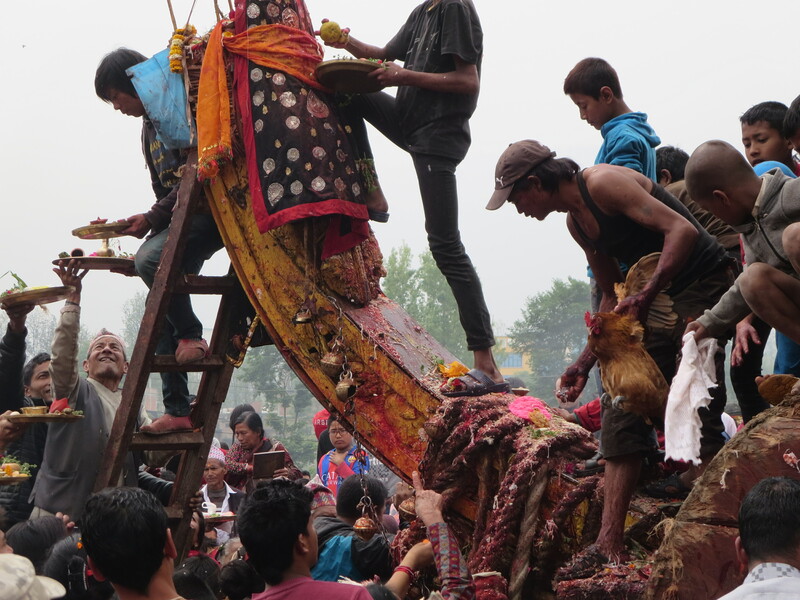 The main festival events all seem to involve collective feats of group strength or bloody acts of chicken sacrifice. As the sky darkens on New Year’s Eve, strongmen grab hold of thick ropes, tugging and chanting together as they erect precarious pillars in the town squares and haul massive, rickety, wooden chariots through the brick streets. Wild bands of boys climb aboard like Neverland orphans playing pirates on tree-house galleons. The exuberant crowd cheers for each inch of progress with the fervor and adrenalin of boxing fans watching a prizefight. There is an air of dark danger to the spectacle: onlookers have been crushed by charging chariots and toppling pillars in previous years, your hotel owner cautions, concerned for your safety, before recommending you attend a New Year’s tongue-boring ritual in a neighboring town with his next breath. New Year’s chariot, Bhaktapur, Nepal. Chickens losing their heads on lunar New Year’s Day 2072, Bhaktapur, Nepal. The origins of Bhaktapur’s Bikram Sambat lunar New Year festival date back to 56 BC when, legend has it, the royal astrologer to the king of Bhaktapur foretold of the precise date and time when the currents of the Bishnumati and Bhacha Khusi rivers would carry sand containing gold to a point of confluence in Kathmandu. Delighted, the king sent his royal porters to collect sand from the riverbed at the auspicious time and place. When sharp-witted Sankhadhar Sakhwa, a local trader, saw the king’s men resting on the riverbank with shovels and baskets he raised a curious eyebrow and wagered that there must be something special in their cargo. “The king has sent you on a fool’s errand,” Sankhadhar, persuaded the tired porters. “Why carry sand so far when it can be had anywhere? Dump your load at my house and refill your baskets just outside the city gates. The king will be none the wiser and your backs will thank you for it.” Sending the porters down the river empty-basketed, Sankhadar sifted through the mound, discovered the gold and used his windfall to pay off everyone’s royal debts, giving the people of Bhaktapur a prosperous, new beginning and starting a new fiscal calendar. Paraders ring in 2072, Bhaktapur, Nepal. Turn the calendar ahead now. As personal luck would have it, you’ve left just in time, too. Ten days into the New Year, five of which were spent in Kathmandu touring UNESCO sites and toasting the New Year with millet beer, it’s you who is now concerned for your Bhaktapur hotel owner’s safety, and the fate of every other Nepalese hospitality worker who carried your bags or brought you food, as images from the 7.8 magnitude earthquake begin reaching you in Bangkok. It is clear, as the news week progresses, that lunar year 2072 will mark a new and tragic chapter in Nepal’s history. 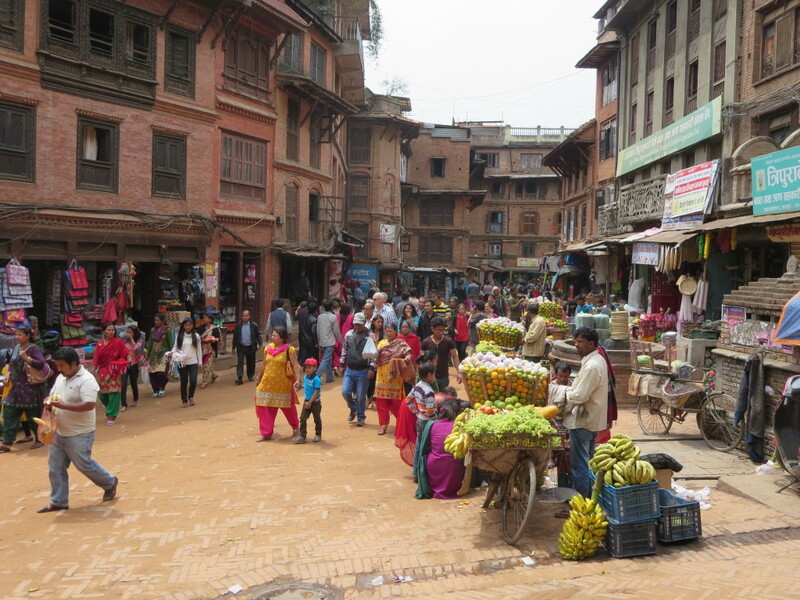 Reports from Bhaktapur’s fragile, historic center are as bleak as those coming in from Kathmandu. 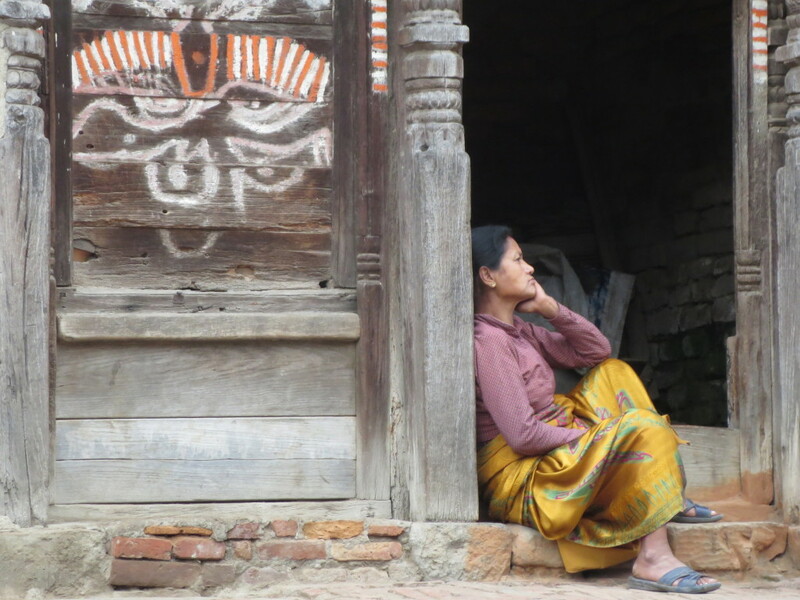 Woman in doorway, Bhaktapur, Nepal. Saye ko laathi, ek ko bhoj. When everybody helps then the work will be lighter. In the best of years, Nepal’s welfare depends on a tourism industry built on aspirational images of mountain climbers and prayer flags, and literally carried on the backs of Sherpas. Today, in a state of aftershock, watching the body count continue to rise, there is no version of Happy New Year that makes sense. The enormous challenges ahead will be equal parts heartbreaking and backbreaking. Instead all that can be hoped is that we, the international community, will not leave Nepal’s people, who have shouldered so many loads up so many seemingly insurmountable climbs for us, to bear the unfathomable burden of 2072 alone. Let this be our toast for the New Year: to those we have lost, to the generous paying off of debts by strangers and to, with Godspeed, Nepal’s next prosperous, new beginning. One way to help: Click here to read Chris’s recent post on the earthquake with information on where to give. 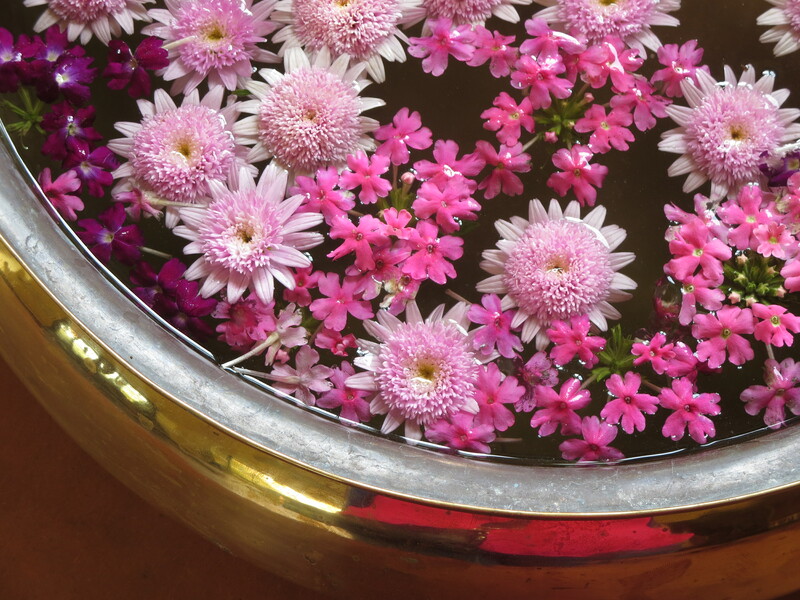 Flower offering in the Garden of Dreams, Kathmandu, Nepal.